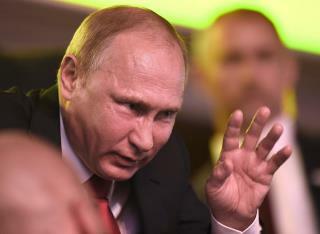 (Newser) – Russian President Vladimir Putin refrained from making any criticism of President Trump at a news conference on Tuesday. Putin also condemned North Korea's latest nuclear test but warned against using military force against the country, calling it a "road to nowhere" that could lead to a "global catastrophe." During the news conference, Putin dismissed a question on whether he was disappointed in Trump as "naive." In comments carried by Russian news agencies, Putin said Trump is "not my bride, and I'm not his groom," the AP reports. Asked how Russia would feel if Trump were impeached, Putin said it would be "absolutely wrong" for Russia to discuss domestic US politics. they already are eating grass while that pig Jong eats steak! Thanks for offering help in containing them, Vlad.